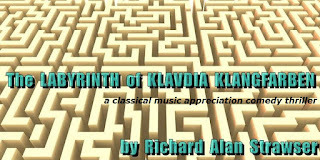 It's finally summer, more or less, that season for putting your feet up – or at least your mind – and enjoying what we call “summer reading.” If you've not already organized a pile of books to dive into, might I suggest the latest offering of my “Klangfarben Trilogy,” after The Doomsday Symphony and The Lost Chord? Dr. Kerr and his assistant Cameron arrive in England to attend the wedding of their friend LauraLynn Harty (who shared with them the adventures of The Lost Chord) and Burnson Allan, a grandson of the 11th Marquess of Quackerly, whose mother, Vexilla Regis (wife of Bognar (“Bugsy”) Regis), lives in one of those stately English “manor houses” called Phlaumix Court where the wedding will take place before Christmas. But of course, as things happen, Inspector Hemiola of the International Music Police's London branch quickly assumes Dr. Kerr is the chief suspect, especially after he disappears. However, he's only gone to Snaffingham – and Phlaumix Court – for the wedding, traveling by train and barely making it to the estate before the roads are completely impassable. While there is a whiff of parody from the likes of Downton Abbey, not to mention (no pun intended) countless mysteries by Agatha Christie and others, there are adventures involving the residents and guests of Phlaumix Court as well as those “downstairs.” We'll meet Mrs. Linebottom the housekeeper, Mrs. French the cook, Sidney Foote and Rudyard Herring the footmen, and of course Vector the butler. The house itself is quite the star in its own right, designed by the late-18th Century Italian architect Philippo Nacci (known to his contemporaries as “Phipo”) whose anti-Palladian symmetry never quite caught on. Instead of balancing around a central axis, Nacci built Phlaumix Court according to the proportions of the Golden Section, meaning, to the casual viewer, everything looks “off-center.” In fact, the whole house is full of mathematical symbolism, down to the themes of certain rooms: the Cube Room, for instance, or the bedroom Dr. Kerr is assigned to called the Dodecahedron Room (though Vexilla prefers calling it the Lilac Room). Art is everywhere, paintings and statues galore, but the biggest claim to fame is the library where, among other things, there are extensive collections of Beethoven research and many papers and manuscripts pertaining to Arnold Schoenberg. Like many such great houses today, in order to survive, the premises are made available to the public or, in the case of the west wing, rented out for private affairs. Concurrently with LauraLynn and Burnson's wedding, a reality TV show involving young performers of classical music is being filmed at Phlaumix Court, called “Pimp My Prodigy,” the latest venture of the once famous cross-over violinist, Skripasha Scricci, his first comeback since the disastrous events of The Lost Chord's Schweinwald Festival. The fact the event is sponsored by SHMRG cannot bode well for LauraLynn's wedding: she is, after all, the cousin of the late Robertson Sullivan and she's trying to arrange a London staging for Faustus, Inc. Among those residents at Phlaumix Court is Vexilla's maiden aunt, Frieda F. Erden, long-time lover of Maestro Schnellenlauter (“Schnelly” to his friends). And it seems they have a secret: there is an unknown society whose responsibility is to protect the heirs of Ludwig van Beethoven and the woman known to history only as The Immortal Belovèd – is it possible they had a child? What could this secret possibly be – and, for that matter, how does it affect Frieda? And everyone else staying at Phlaumix Court? 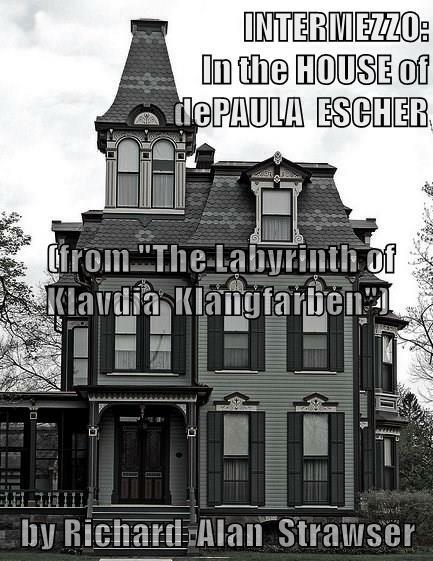 So... are you ready to enter the Labyrinth? 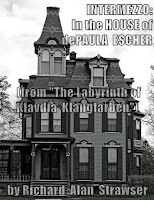 While many novels, especially mysteries, begin with a brief prologue – in my previous novels, I referred to them as “prelude” and “overture,” respectively – this novel begins with an extended short story (I thought of calling it a symphonic poem but decided simply on “Intermezzo”) called In the House of dePaula Escher. 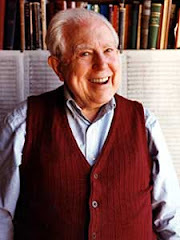 It not only ties in events of the past two novels – the character of Sebastian Crevecoeur, the existence of the parallel universe Harmonia-IV from The Doomsday Symphony (where dead composers continue to create new works) – it also sets up things to come in The Labyrinth, anticipating the location of the story if not the events of the future, all intermixed within its dream-like state. In several ways, it also looks forward to the next novel which I'm currently working on, In Search of Tom Purdue, at least in the introduction of a character who was a fellow grad-student of Kerr's who does not, in actuality, teach at St. Sisyphus Community College (founded by Roland Stone) though he does live in the Philadelphia suburb of Marple. The “Intermezzo” combines parodies of one of Edgar Allan Poe's most famous stories and the art of M.C. Escher with various bits of Proust (especially the opening of Swann's Way, itself subtitled “Overture”). While events seem to skip around or blend into each other as often happens within a dream, certain events may be repeated where memory sometimes disagrees about the details. 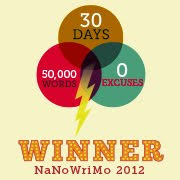 In the end it just... well, like many dreams, just kind of dissolves as the novel-proper begins. It may seem a bit of a roller coaster ride to open a novel with, but that's only the beginning of the journey. 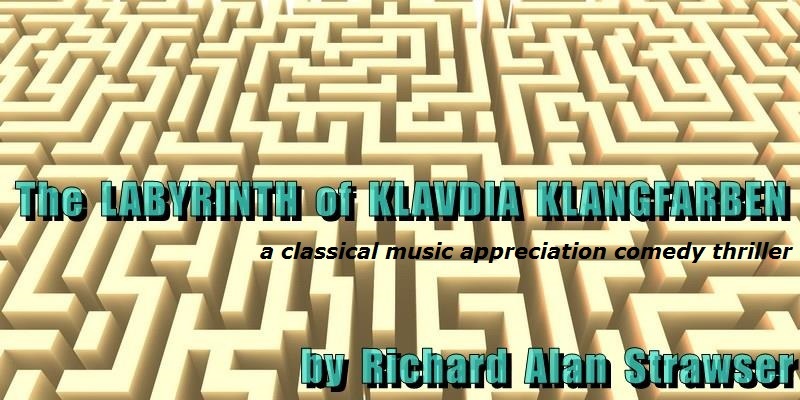 And now... it's time... to enter The Labyrinth of Klavdia Klangfarben.